An absolute classic taken to dazzling new heights, LuSH-101 proves to be well worth the wait, despite a few flaws. Great sound. Eight independent layers! Nice presets. Classic, effective layout. It's an SH-101 on steroids. No favourites browsing. GUI is too small and fiddly. 2012 marks the 30th anniversary of one of the most influential analogue monosynths ever made. Roland's SH-101 wasn't the most powerful synth on the market when it launched in 1982, but it was certainly affordable, it sounded great, and its simplicity and straightforward slider-based interface made it child's play to program. Consequently the SH-101's list of notable users is as illustrious as that of any synth in history. "LuSH-101 is actually a monster stack of eight SH-101s: each is called a Layer and all are operated totally independently"
Nevertheless, virtual versions of the 101 are pretty thin on the ground and for some time now D16 Group have been promising to fill this void - LuSH-101 has been in development for years on end. Rather than create a literal SH-101 clone, though, they've doubled the number of envelopes and LFOs, made it 32-voice polyphonic and added modern refinements and effects. Oh, and, crucially, LuSH-101 is actually a monster stack of eight SH-101s: each is called a Layer and all are operated totally independently, brought together - along with a useful collection of effects - at the built-in final mixer stage. The LuSH-101 interface is split into three main sections: Synthesis, Modulation Matrix and Master Mixer. 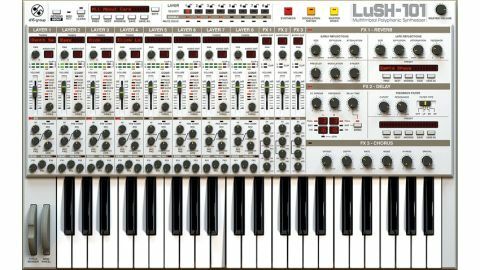 Thanks to its enhanced parameter set, the first of these looks more like Roland's later JD-800 or JP-8000 synths, which isn't a bad thing at all, as both utilised the same interface style that made all three synths so intuitive and fun to use. It isn't all retro, though, and one of our favourite things about the interface is the excellent way D16 have kept the controls as simple and accessible as the original, while adding all the new, modern functionality we expect to find in a software instrument. A good example is the LFO rate slider: in Free mode, it moves smoothly from 0.1Hz to 40Hz; but engage tempo sync and the same slider jumps from one sync'd note value to the next. We have two issues with the interface, however. First, D16 need to add an increased size mode to make some of the parameter legends visible on all screens - some of the text labels are absolutely tiny, being just a few pixels high. Second, when altering some parameters (such as filter cutoff) via the GUI, the sweeps sound stepped rather than smooth. Hopefully this will be remedied in an update. Next comes the Modulation Matrix, which is visually at odds with the sharp, photorealistic Mixer and Synthesis interfaces. But in use, the no frills approach makes perfect sense. Pick a source, choose a destination and set the amount of positive or negative modulation with a large, clear slider. And you can add as few or as many mod assignments as you like - it's all beautifully, refreshingly simple. "The Main mixer is where LuSH-101 becomes much more than the sum of its parts"
The Main mixer is where LuSH-101 becomes much more than the sum of its parts. In addition to the requisite level and pan controls, each of the eight channels features a compressor, EQ and three effects sends. The effects (reverb, delay and chorus) all do the job, and in case that isn't enough, LuSH-101 can emerge on up to 11 separate outputs in your DAW. Unsurprisingly, all this power comes at the expense of a hefty CPU load so there is a lower-quality mode for browsing. "This is one seriously great-sounding synth. Whether you're after basses, chords, pads or anything in between, there are simply no weak links"
LuSH-101 comes with a large preset library to showcase what it can do in both single- and multi-zone (Global) modes. And it can do a lot - this is one seriously great-sounding synth. Whether you're after basses, chords, pads or anything in between, there are simply no weak links - and the tempo-based presets could probably form a compelling basis for a fair few tracks on their own (with an arpeggiator per Layer you can create some pretty special combined sequences). It doesn't have quite the comprehensive patch library of something like Sylenth1, but it is big and varied, with a number of convincing classics. In the spirit of the 80s original, it also offers up some characterful synthesised kick drums. And for the performer, the multi-patches are really quite amazing and so easy and powerful to use that even non-keyboard players could feel confident playing them live. Annoyingly, all of this good stuff is slightly undermined by the baffling fact that while you can rate patches from one to five stars, there's no way to browse them by rating. However, in a counterbalancing stroke of genius, each layer can be locked - as indicated in the browser window - so you can browse the multi presets without your chosen layers being changed. And there are so many other things we love about LuSH-101 but don't have space to describe in detail - features like the unison mode, the arpeggio/gater, PWM and the insert effects available to each Layer (including Chorus, Flanger, Distortion and Tremolo). In fact at just about every stage, D16 manage to totally vindicate the amount of time it's taken them to finally get the thing finished. LuSH-101 truly is the spiritual successor to Roland's diminutive classic. Despite being vastly more powerful and complex, it takes inspiration from that timeless, faultless interface to present a synthesiser that's a joy for the experienced programmer and as easy for a beginner to get into as any virtual instrument we've ever tried. It combines the straightforward and clear design philosophy of the SH-101 with the power and intricacy of modern soft synths, it sounds beautiful, and it confidently proves that even after 30 years of progress, some great ideas just don't go out of fashion.